Since last November’s election, I have pretty much steered clear of criticizing Rob Astorino. He beat me, fair and square, and negative commentary from the losing candidate, even if justified on the merits, invariably comes across as sour grapes. But I really can’t refrain from pointing out this article describing the County Executive’s campaign stop at a gun show in Saratoga Springs. Last year, Mr. Astorino tried to avoid any discussion of gun safety – figuring rightly that his views on the subject would be unacceptable to the majority of Westchester residents. 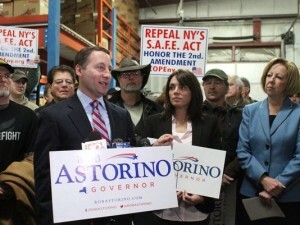 Now, electioneering for governor in the more conservative upstate region, Mr. Astorino is showing his true colors and proudly vowing to repeal the NY SAFE Act. Points, at least, for enhanced honesty. Previous PostTalking Development on VOXNext PostIn The Beginning . . .